Hyundai Canada encourages you to “Take your weekend to a whole new level with the Hyundai Tucson” in its latest commercial. 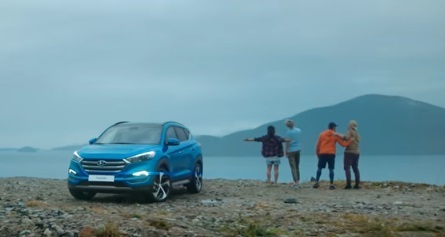 The 30-second ad shows two young couples on a camping trip with their Tucson, which is equipped for new adventures thanks to its high strength superstructure, All-Wheel Drive, and other features. The SUV is showcased as it speeds up a road to follow one of the men, who leaves his friends behind and runs through the forest to get to their next destination. Despite his intention, he doesn’t get there first. Arriving on the top of a hill, he finds the other three weekenders already there. “Take your weekend to a whole new level with the Hyundai Tucson” the voiceover says at the end of the spot, which features the song “Until We Go Down” by Ruelle, from her 2015 album “Up in Flames”. This song was also featured in opening credits of MTV’s series “The Shannara Chronicles”. The 2018 Tucson, starting from $24,999, boasts a stylish exterior, with roof rack side rails, smart power liftgate, heated side mirrors with available LED side repeaters, LED headlights, LED tail lights, alloy wheels. The interior features heated front seats, rear seats, and steering wheel, ventilated front seats, proximity keyless entry with push-button ignition, multimedia touch-screen displays, 8-speaker Infinity audio system, and panoramic sunroof. The SUV also features “a wealth of technology to keep you connected on your adventures”: while the standard Bluetooth hands-free phone system enables you to enjoy hassle-free connectivity, the available Android Auto and Apple CarPlay technology allows you to effortlessly integrate select apps from your phone. The tech-filled interior is also “extremely spacious”, according to the automaker, offering up to 1,754 litres of cargo capacity.